With the Nintendo Switch Online service now in full swing, people have either jumped on board or have said goodbye to online play. If you are the former, as well as Cloud Saves and everything else Nintendo offered with the service. We were also allowed to download NES games to our Switch. Now I am all for playing classic Nintendo games for the upteenth time but I do like physical representations for my games. Which is why I have created my own NES – Nintendo Switch Online Box Art. I like to look out upon my bookcase full of games and decide which one I want to play today. For games I own digitally, I sometimes print out box arts so that I have a “physical” case for them. Other games, I prefer alternate box arts, that look nicer than the official cover art. The NES – Nintendo Switch Online is a selection of games that you can play on your Switch providing you have a Nintendo Switch Online Subscription. It is a digital only service and will not be recieving a physical cart in the forseeable future. It would go against the logic of having the service. That is why I made up my own box art. Well, that and the fact I have far too much time on my hands. 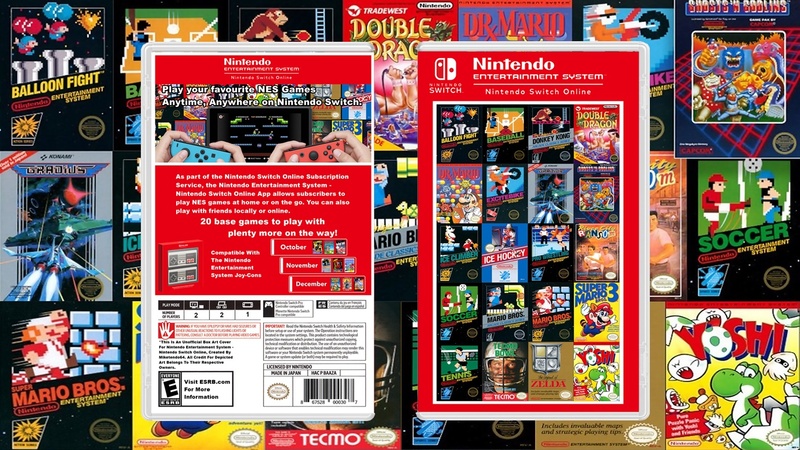 I won’t lie, I made this for myself more than for anyone else in particular but I thought I would share my NES – Nintendo Switch Online Box Art here for anyone else that would like to print their own. The images are already in the proportioned size they need to be, give or take a millimetre. The internal cover art is optional. The sizes in centimetres should be 161mm x 209mm wide. I also have a link to the PDF file which already has the cover art in the correct size. It is also centered so both images should meet up evenly. For some reason, the PDF loses sharpness around the text. Hence why I have provided the original PNGs should you wish to add them to Photoshop to touch them up prior to printing. If you do decide to print them out, please feel free to share them on Twitter and tag us @miketendo64. Also leave a comment below on what you think of our handiwork. If you would like to know more about available Switch Cover art, check out our guide on how to Create Your Own Alternate Switch Box Art Covers.